Sail to the land of smiles for an enlightening immersion into the art of yoga. of the science during Yoga Teacher Training with Us. Since establishing themselves as one of the most trusted yoga schools in India, Rishikul Yogshala has now resolved to spreading the traditional and authentic yoga teachings of India to the beautiful country of Thailand. Known by many as the land of smiles, this area boasts a peaceful, harmonious way of life; the perfect setting to embark on a journey of self-discovery through nature, culture, and the historic art of yoga. With experienced India teachers, students can enjoy the serenity of Thailand combined with the invaluable guidance of authentic practitioners at Yoga Alliance Teacher Training In Thailand. Join us in March for a 200 Hour Yoga Teacher Training In Thailand at Eco Logic, a riverside resort for charity located deep within lush rainforests and cascading waterfalls; a month long program that will leave you feeling both refreshed and full of purpose. Why Go for Yoga Training in Thailand? Surrounded by abundant rainforest, majestic waterfalls, and natural hot springs, the tiny village of Chiang Mai, Thailand is a perfect blend of traditional Thai culture and nature-oriented brilliance. Known by many as “the land of smiles”, not only because visitors love its natural beauty and historical riches, but also because of the country's friendly people and gentle way of life. Thailand replenishes the yogi and the adventurer in you with the most beautiful beaches, picturesque hiking trails, and vast viewpoints. 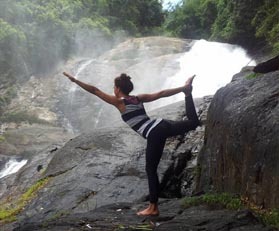 Practice sunrise yoga alongside a babbling river, meditate atop a glorious waterfall perched deep within a lush jungle, or take a boat ride to remote and unexplored islands. Dive into your spiritual practice as you visit one of the many exquisitely-adorned temples; listening to soulful mantra and practicing meditation techniques with some of the most ancient Buddhist monks in Southeast Asia. The beautiful country of Thailand has truly inspired us to conduct our Yoga Courses In Thailand in its admirable embrace. Become a certified yoga practitioner and teacher while undergoing a Yoga Instructor Course in Thailand in the scenic lap of Chiang Mai. 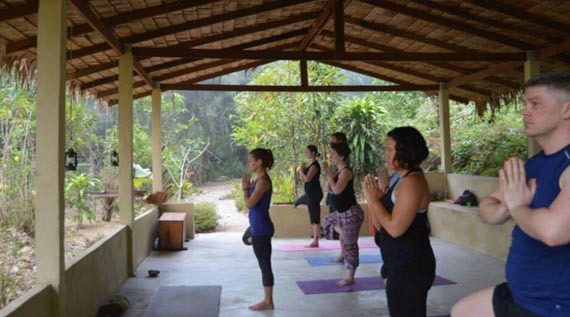 Learn the art of yoga asanas and delve into the hidden layers of yogic philosophy in the gorgeous setting of tropical rainforests and cascading waterfalls. 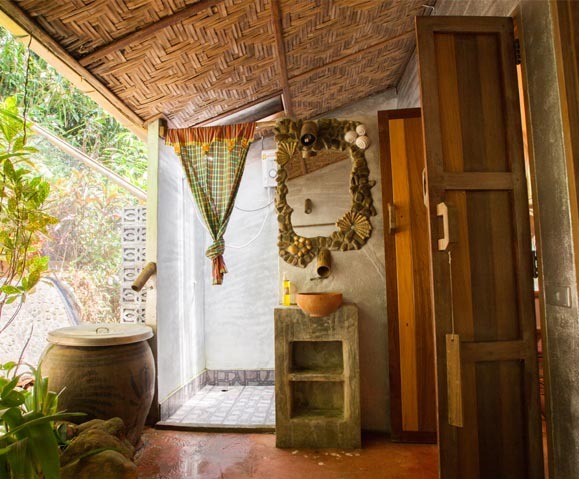 A Yoga TTC in Thailand provides a perfect blend of traditional teachings infused with the right sources and ambiance to practice the art in its purest form. Undergo cleansing rituals and practices for complete purification of the mind and body, while traditional Thai massage with trained therapists work towards restoring the body vials back into its form. Teachings of the most ancient form of yoga styles: Hatha and Ashtanga. Many sacred and contemporary yoga forms have emerged from these two yoga styles that are practiced across the globe. Learning of these two classical forms helps deepen the roots in authentic yogic science. Education of the human anatomy and how body functions and responds to the practice of yoga. 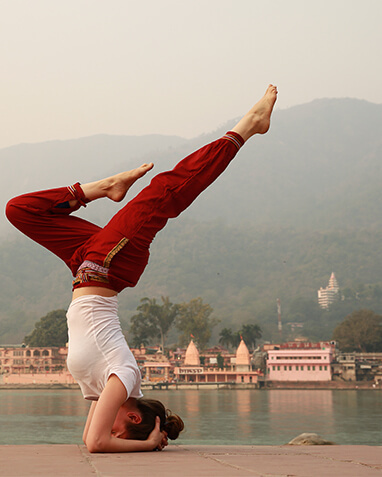 The practice of yoga includes body movements and breathing techniques that require a thorough understanding of the human mechanism. In order to teach with magnificence, it is crucial to understand the human science for the correct implementation of yogic wisdom in its rightful place. Learn how to delve, perform and release the yoga postures correctly and safely through the study of Adjustment and Alignment techniques. Learn how to modify the poses according to the body type and alternative styles of performing the asanas for maximum benefits through adjustment and alignment classes. In order to unfold the bottomless layers of the yoga postures, teachings of Adjustment and Alignment are imparted. Imbibe the sacred teachings of Patanjali Yoga Sutras. Get insight into the moral codes of Yamas and Niyamas and adopt a yogic lifestyle. Understand these disciplines of yogic life and learn how to implement them in real life for a fulfilled living. Achieve oneness and peaceful mind through the technique of Meditation. Meditation is one of the core element of yogic practices as it helps to calm the fluctuations of a mind so that it can rest in a state of tranquility. The practice also reduces stress, improves concentration, and enhances cognitive abilities when performed routinely. Study of diverse yoga ancillaries and props for protection, restoration, and modification in order to reap the healing benefits of yoga asanas fully. Prime Emphasis on Breath-Based training. Solving prolonged mental and physical disorders. 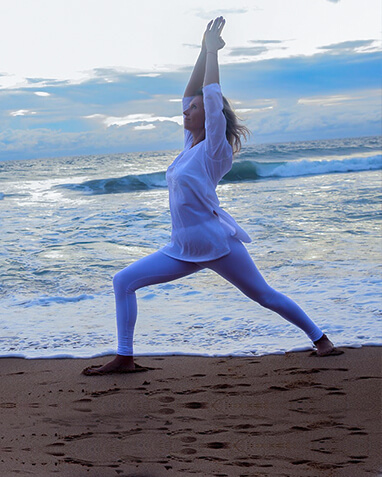 Understand how regular yogic practices heal common disorders. Attend sessions on how to spread the art of yoga to future yogis effectively. Becoming a teacher demands practice, dialogue, and demonstrations for fruitful results. During this segment, you get a golden chance to conduct live yoga classes and to undergo sessions on how to take yoga classes in the most authentic manner. Self-learning and Self-practice of all the yogic lessons learned during the program. Two days in a week-- Wednesday and Sunday are dedicated to Self-practice. Self-practice is important for deepening one’s own knowledge of yogic science. The classes are conducted under the guidance of certified teachers from Rishikesh and Canada. Study of another ancient science of life-- Ayurveda and its role in improving the human life. Ayurveda is the oldest healing system based on the usage of organic and herbal matter for restoring the wellness of a human body and mind. Every yogi is recommended to study Ayurveda for complete knowledge of both the traditional systems. Study of Shat-Kriyas or six yogic works according to Hatha Yoga Pradipika and preparing the body for higher meditation practices. 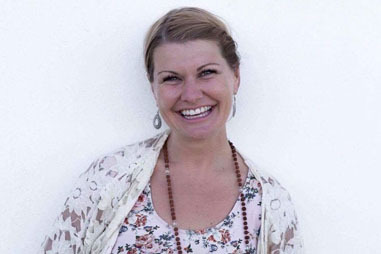 Learning of the contemporary art of Laughter yoga therapy. Founded on the scientific principles that mental effects of induced laughter are akin to spontaneous one. Easy and fun to practice, this art form can be practiced by anyone irrespective of age and body type. 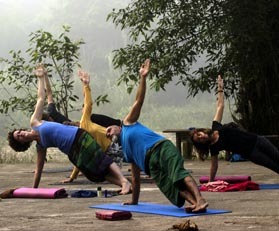 Get awarded Yoga Alliance recognised Yoga Certification In Thailand at Rishikul Yogshala. The certificate shall validate your credentials as a recognized yoga instructor and grants you the liberty to practice and preach the science of yoga in every corner of the globe. 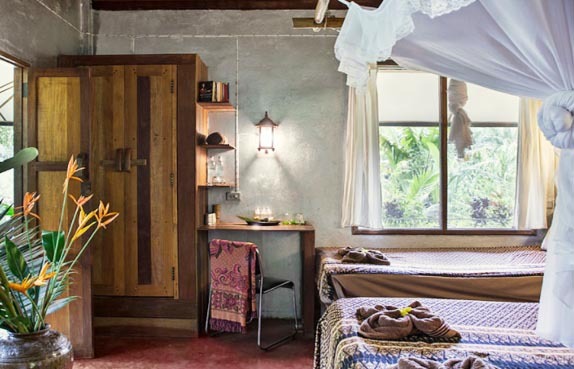 Nestled within the lush Thai rainforest, Eco Logic is an eco-conscious paradise on earth. Practice yoga alongside a cascading river, breathe in the fresh forest air, and wake to the peaceful sounds of birds singing to welcome a new day. 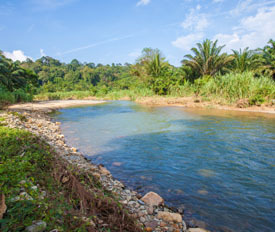 The resort boasts a riverside 10-bed dorm with shared bathroom, and 4 riverside shared rooms with private bathroom. 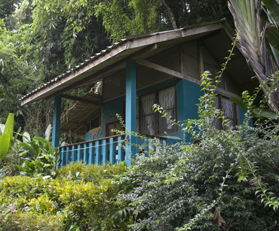 All rooms are equipped with comfortable beds and mosquito nets. Lounging hammocks adorn walkways, campfire pits are strategically placed in common areas, and a pebble beach alongside the river makes for a beautiful spot to cool off and find solitude. Abundant gardens growing fresh produce line the resort grounds, and the sound of children’s laughter can be heard in the distance as the on-site Thai Child Development school teaches local adolescents with disabilities. 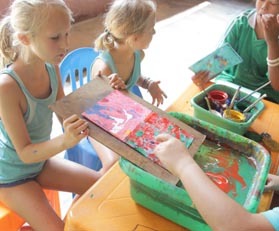 You can thank yourself for your karma yoga contribution in enrolling in a YTT at this location as 100% of the resort profits are donated to this school foundation. To read more about this inspiring charity, click here. 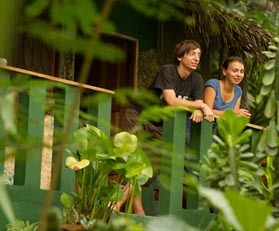 Lush, organic fruit trees and hydroponically grown vegetables can be seen from every area of the resort grounds. 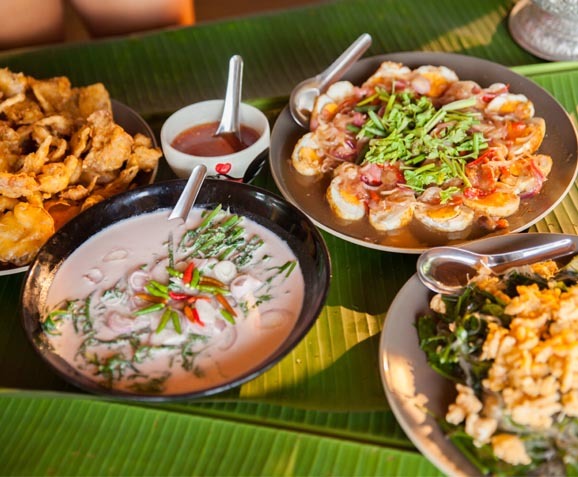 The in famous Thai chefs provide home-cooked, buffet-style meals three times daily with both Thai and Western cuisine. 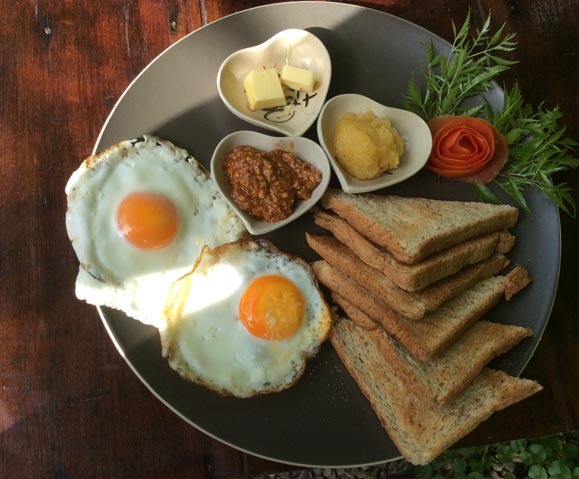 Free-range chicken’s lay tasty eggs for breakfast, and sustainably sourced herbal teas are available any time of day. 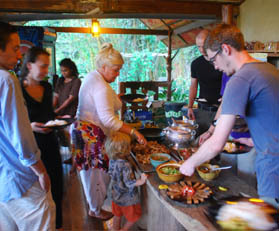 Meal times make for superb dining with a majestic view from the restaurant overlooking the jungle below. 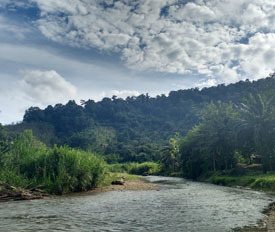 Internationally connected via Suvarnabhumi and Don Mueang International Airports, Eco Logic can be accessed by either bus or domestic flight into the town of Ranong, Thailand. By Airway : Nok airlines flies domestically three times daily into Ranong Airport. Flight duration is about 1.5 hours from Bangkok. By Land : Comfortable VIP Buses depart from the Southern Bus Terminal in Bangkok to Ranong in the morning or evening for overnight transfer. Duration of bus travel is approximately 10 hours. 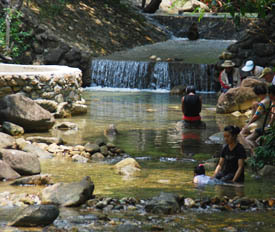 Eco Logic is a tranquil and natural setting for teaching yogic practices in Thailand. A humble abode for spiritual work, it is safe to say that the resort is adorned with nature’s most magnificent creations. 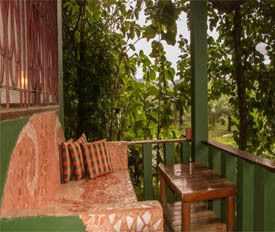 The backdrop is embellished with ideally lush rainforst, while the riverside shala hold space for peaceful daily practices. 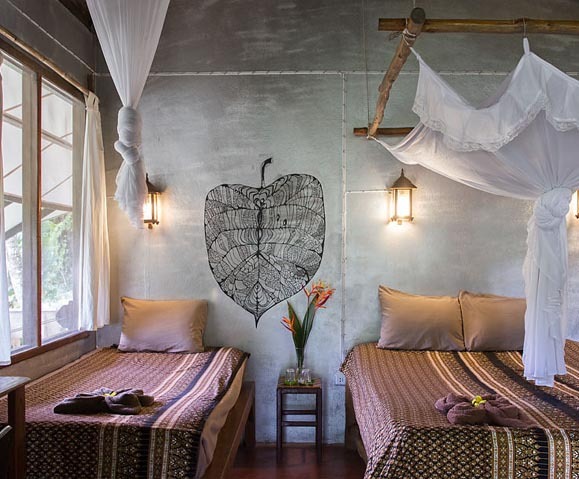 A serene space off-the-beaten-path in Thailand, the resort is a perfect mix of raw yet restful accomodation. Housed with hand-crafted wooden art and lined with plush, organic gardens, guest can enjoy vast views while dining in the tree-top restaurant overlooking the mountain range. 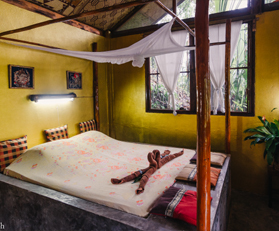 The location makes up for an ideal stay during a transformative yoga program. Incorporated with all the modern amenities merged with the simplistic demands of yogic lifestyle, the stay at the hotel becomes an experience to cherish. Serving home-grown, organic cuisine created by talented in-house chefs, guests will feel nourished and heathy as they embark on this transformative program.